Heats up faster than other sous vide devices. What Is Sous Vide Again? When we reviewed the Anova Precision Cooker last year, we dove into the details of sous vide. Effectively, sous vide is a fancy French word meaning “under vacuum.” You place food in a plastic bag or glass jar, then put it in water. Then the sous vide device adjusts the water temperature and the food is cooked in the water bath, slow and steady. The devices are very precise so your food is cooked consistently every time. Compared to using an oven (where the 375 degrees you dial in might not actually be 375 degrees but 382 instead), when you dial in 132.5 degrees on a sous vide unit, you get it. While that sounds like something fussy, don’t mistake the precision for complication. It’s a method that’s as complicated as you want it to be. ReviewGeek’s editor, Jason, is a huge sous vide fan and owns multiple Anova units and accessories, but he’ll be the first to tell you that you don’t have to go all in to reap the benefits. 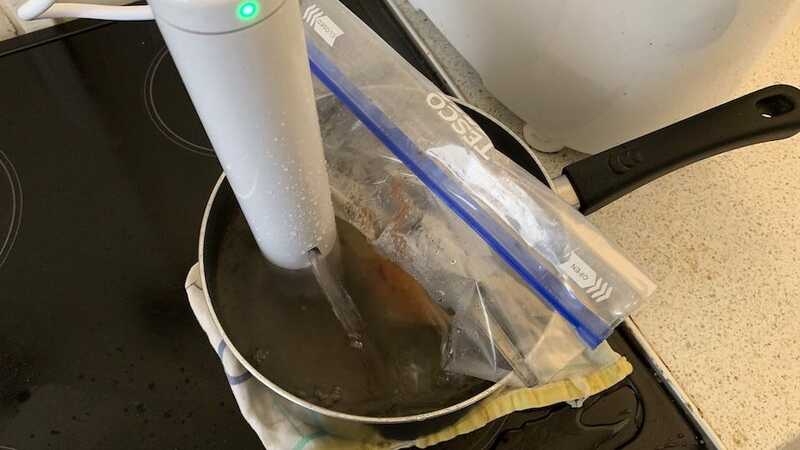 You can also just toss some food in a Ziploc bag, let it sink slowly into the water to naturally push the air out, and leave the sous vide device to do all the hard work for you. It’s entirely up to you. The ChefSteps Joule Sous Vide hopes to be all you could need, and be your first choice over the well established Anova Precision Cooker. So, how did it perform? The ChefSteps Joule Sous Vide is smaller and sleeker looking than the Anova Precision Cooker. It almost seems like something Apple would have come up with, right down to the intuitive and friendly looking packaging as pictured. Only 11 inches tall and weighing about 1.3 pounds, it’s actually small enough to toss into a drawer or cupboard without it getting in the way. It’s definitely a little smarter looking than the Anova, but that comes at a price. 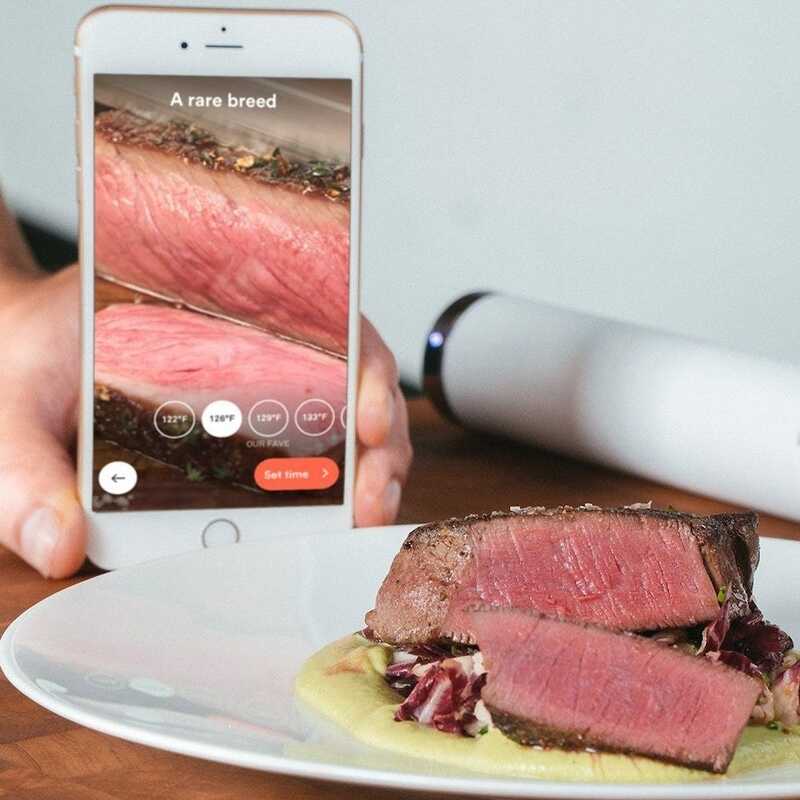 Namely, the ChefSteps Joule Sous Vide depends entirely on app connectivity to use it. There’s no display on the top of the device like with the Anova, so any time you want to check on it or tweak a setting, you need to dive into your phone’s Joule app. That’s not a massive hardship if, like me, your phone is always with you, but it’s something to bear in mind (especially if more than one person in your household will be using it or you want to use it without always fetching your phone). Setup is very straight forward. 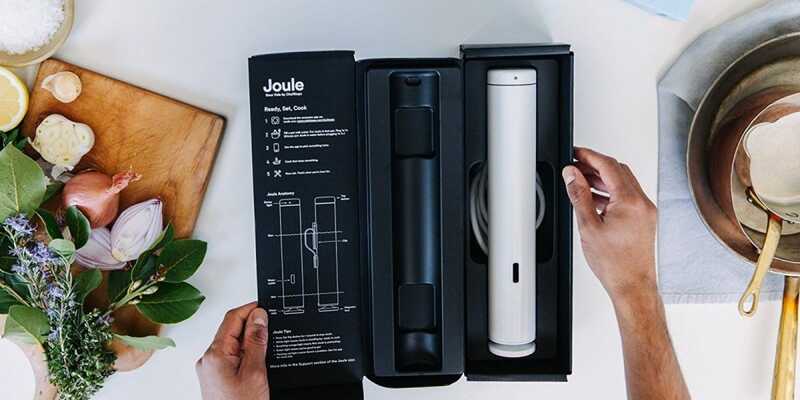 Just plug the ChefSteps Joule Sous Vide in and load up the Joule app. There’s a clear button on the app for pairing up your new Joule, and the app and device do most of the rest of the work for you. I just had to enter my Wi-Fi password. There’s a choice to name your Joule as well which could be useful if you have multiple devices. A 5-minute update later and I was ready to cook. The Joule app recommends a few specific options for starting out. Simple things like a chicken breast, burgers, a pork chop, or steak are the ideal place to begin. After all, how often do you end up undercooking or overcooking these things when cooking the regular way? Sous vide comes into its own when cooking meat, ensuring that something like a chicken breast is juicy and delicious while also prepared safely. As a dodger of red meat (I’m sorry), I went with a free-range chicken breast as my first test. The app recommends filling up a pan with warm or hot water, but you can also use cold water. The only difference is it takes longer to heat up. You can choose to clamp the Joule to the side of the pan or do what I did and rely on the magnetic base that keeps it steadily attached to the bottom of your pan. From there, it’s a short process in the app to set a temperature. In the case of chicken, you can choose between 60c/140f to 80c/176f. 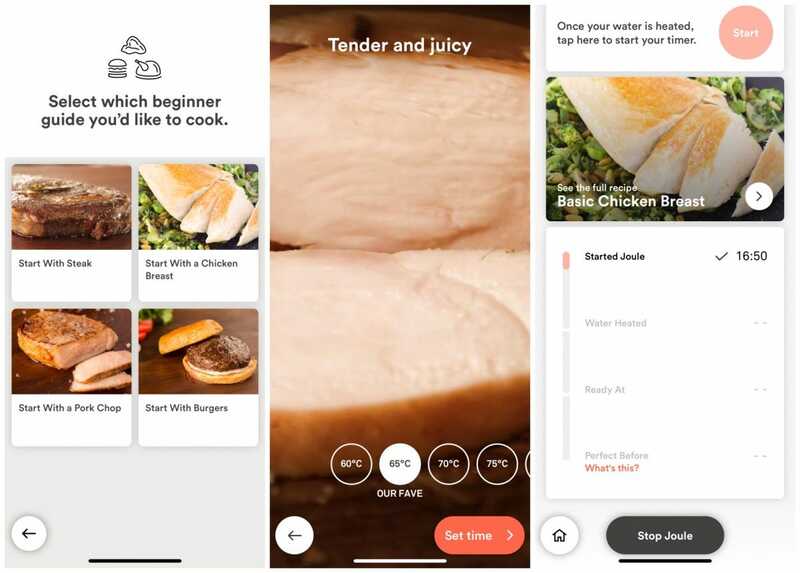 Each temperature has a small description such as “tender and juicy” or “set and fibrous” with the app suggesting the optimal temperature for you. As I said, it’s foolproof. Warming up the water took a few minutes at most with the app reassuring you with slow yet steady increases on the temperature gauge. 1100w of power means it’s a far faster process than the Anova’s 800w. Perfect for impatient chefs like me as it meant I could spend that time seasoning the chicken with some garlic olive oil, sea salt, and some smoked paprika. Once the water reaches the desired temperature and the app tells you so, you can place the bag slowly in the water. While vacuum sealed bags are definitely the best option here, a Ziploc style bag also works (providing you make sure there’s no air in there). I went with the ghetto lazy method (as pictured) of a Ziploc bag and a couple of spoons to weigh my chicken breast down in the saucepan. It’s a reasonable enough method when you’re starting out or just want to experiment fast. Once the bag is submerged, you just hit the start button on the app, and that’s that. Walk away until the app tells you it’s done. For my chicken, I was told it’d be about 90 minutes. It was right. 90 minutes later, the app pinged a notification to my Apple Watch, and I headed back to the kitchen. The results were surprisingly perfect. Sure, the chicken looked a little plain and, well, boiled, but it certainly didn’t taste like that. 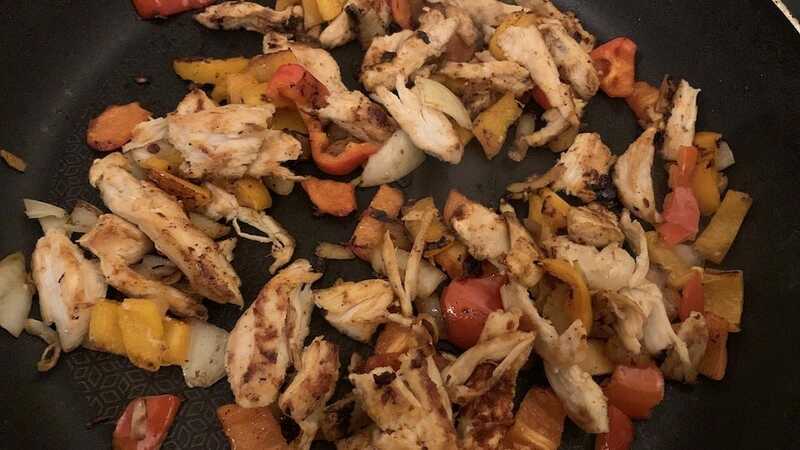 I chose to shred it and add it to a pan full of peppers and onions before putting in a quesadilla. It was delicious and far superior to when I’ve roasted chicken and overcooked it, so it’s turned into a dry husk. Those were some pretty tentative steps from someone who’s a wimp about experimenting in the kitchen, but you know what? 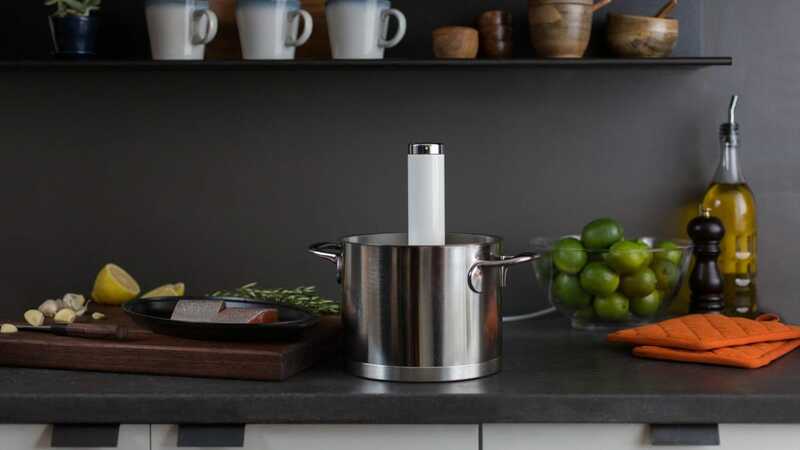 The ChefSteps Joule Sous Vide empowers you. After that wary first step, you find yourself exploring the Joule app more and seeing what can be accomplished. Perfectly cooked vegetables soon became one of my favorites along with a juicy steak (albeit not for me) that looked as good as anything the Anova could produce. Finally, I could cook steak how people requested it to be, instead of blindly hoping for the best and inevitably not getting it quite right. It’s effortless enough that it’s perfect for a dinner party too as you can leave it cooking while preparing other things. The app also offers up dessert ideas although obviously, this involves a bit more effort than merely bagging up the ingredients. Sous vide is the ideal starting point for a different kind of dessert than usual. It’s easily a form of cooking that grows on you. At first, it might sound a little gimmicky and nerdy for the sake of it, but then you get the hang of it. It’s like slow cooking, only better. The Big Question: Anova Or Joule? So, what’s the best option for you? Do you go with the Anova Precision Cooker or the ChefSteps Joule Sous Vide? The ChefSteps Joule Sous Vide is easily the fastest of the two. The extra 300w makes a big difference, and you won’t have to hang around as long waiting for water to heat up (even though the Anova can heat to a higher temperature overall). However, you are dependent solely on the app. 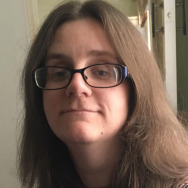 The app is excellent and super simple to use, but sometimes you might find yourself wishing you could tweak something on top of the device rather than pull out your smartphone. The ChefSteps Joule Sous Vide also lacks Google Home support which the Anova has, although they both provide Alexa capabilities which certainly helps a ton if your hands aren’t clean. The ChefSteps Joule Sous Vide is also far easier to store, and it has a slightly higher fill capacity. But, it’s also pricier. The White Stainless Steel variety we tested costs $199 compared to the Anova’s $119 price tag. The $80 difference you save with by buying the Anova happens to be just about the perfect amount of money for stocking up on accessories to go with it. So, the Anova still just about edges in front of the ChefSteps Joule Sous Vide. However, if you can spare the extra bucks, it’s tough to turn down the elegance of the Joule. Ultimately, it’s a little like choosing between Mac or PC. Both do the job admirably. Just in a slightly different way to each other. Regardless, once you eat sous vide meat, it’s going to be tough to go back.